Putin Announces New Hypersonic Weapon Will Be Deployed In "Months"
Russian President Vladimir Putin said Thursday that Moscow would deploy new Avangard hypersonic glider warheads in the "coming months," adding that Russia's hypersonic program is the most advanced in the world, according to a new report from the Financial Times. "We are improving our attack systems in response to the construction of a missile defense system by the United States. Some of them are already in service, and some will be supplied in the near future," said Putin, who was speaking at the Valdai Discussion Club in the Black Sea resort of Sochi Thursday, adding that Moscow's hypersonic weapons program was well ahead of China and the US. "The Avangard system [will be deployed] in the next few months." "It is a fact of life that we are ahead of all our partners and competitors in this sphere of high precision, hypersonic weapons," he said. "No one else has that . . . In that sense, we feel very comfortable, very safe." This latest revelation comes seven months after Putin shocked Russia's political elite at the annual Russian state of the union address in March by claiming Moscow had developed new nuclear weapons that cannot be shot down by US anti-ballistic missile defenses. The missiles, Putin said, are capable of striking almost any point on Earth while traveling at hypersonic speeds. In what sounded like an implicit threat to the West, Putin also said back in March that Russia had repeatedly warned Washington not to go ahead with anti-missile systems that Moscow fears could erode its nuclear deterrent. However "nobody listened to us. Listen Now," he said, to a loud ovation from the crowd of legislators, officials, and dignitaries. A hypersonic glider is a projectile that can fly at speeds of over Mach 5 (+3,800 mph). The glider is extremely maneuverable, which makes its ballistic trajectory unpredictable, thus rendering most Western missile defense shields useless. Still, according to CNBC of the six weapons Putin debuted in March, only two of them will be ready for war by 2020. Russian MiG-31K fighters and Tu-22M3 long-range bombers are seen air launching the hypersonic missile. The Kinzhal is air-launched by the aircraft, which rockets it up to Mach 10 (7,600 mph). The missile has a range of 1,240 miles once launched and has struck fear in NATO officials. The hypersonic missile with intercontinental range and the ability to fly Mach 20, more than 15,000 miles per hour, will be entering the battlefield in the near term, according to a Tass report. Earlier this year, serial production of the missile’s warheads had begun, according to a report. While combat deployments for the Sarmat ICMB system are not expected until 2021, a TASS report Thursday said “pop-up tests,” the ability to propel the missile out of its underground silo had been successful. TASS noted flight trials are next. Trials of the underwater nuclear drone could be next. The video shows the manufacturing facility of the alleged Poseidon drone, which can carry a nuclear warhead to an enemy port or wipe out an entire carrier battle group. Russia’s Defense Ministry says this nuclear propulsion system for the cruise missile, dubbed ‘Burevestnik’ has been successfully tested. The missile, which is designed to have “unlimited range and unlimited ability to maneuver,” will undergo more ground tests in the near term. The “combat laser system” Putin announced back in March is the most mysterious of them all. Little information has been provided on the system. However, the video features a military unit, operating with several Peresvet systems, accompanied by support vehicles. 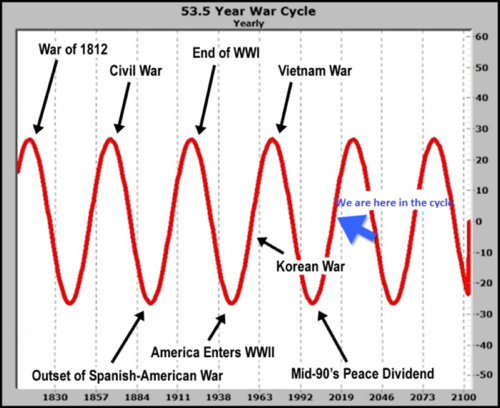 Glancing at the current position in the 53.5 Year War Cycle, it seems the “Mid-90s Peace Dividend” has transitioned into the chaotic world of today: Cold War 2.0, but this time -- conflict is more likely.